African Risk Capacity (ARC) has been named by CFI.co, for the second year running, as the most innovative environmental, social, and governance risk protection provider in Africa, in recognition of its dedication to technological and financial innovation, and its contribution to capacity building on the continent. ARC provides a platform for African governments to proactively contain the impact of natural disasters by prioritising the resilience of households. Set up in 2012, ARC is a public-private partnership that comprises an international organisation (ARC Agency – a specialised agency of the African Union); and its financial affiliate the African Risk Capacity Insurance Company Limited (ARC Ltd) – an insurance mutual. Any African government can join ARC by paying an annual premium to insure a portion of its disaster risk and linking this to a predefined contingency plan. 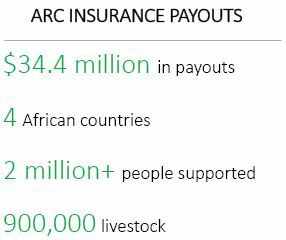 Entering its fourth year, ARC has increased its total insurance pay-outs to countries impacted by disaster to $34.4m. The company paid out $8.1m to the Malawian government after the country was struck by drought last year, having previously paid $26.3m to Senegal, Mauritania, and Niger in early 2015 after drought impacted parts of the Sahel. These pay-outs have helped support more than two million people through food distribution and cash transfers as well as 900,000 livestock, thus boosting households’ resilience. In addition to drought insurance, ARC has also expanded its offerings to provide cyclone insurance. However, the impact of disasters is not proportionate in developed and developing countries partly because in many of the poorest parts of the world, extreme weather poses a greater threat to both the lives and the economic and environmental foundations of entire communities. Disasters in low-income countries can undermine overall economic growth and development and hit the agriculture sector particularly hard. With over half of its labour force involved in agriculture, Africa has especially suffered from the impact of droughts, floods, and cyclones. In the wake of a big natural catastrophe, families can resort to cutting nutritional intake, pulling their children out of school, and selling off key assets such as livestock. In dire cases, affected communities can be forced to migrate. At a national level, governments are forced to reallocate scarce budgetary resources away from critical infrastructure and social investments to support the affected populations or wait on humanitarian aid which typically takes months to flow to the affected communities and can be uncertain in quantity. Discussing Senegal’s drought in 2011 before it joined ARC, Mamadou Moustapha Ba, director of Economy and Financial Development Cooperation, notes that an almost 40% percent fall in crop production had badly impacted economic growth. While the government had managed to raise $70m, it was not without some major challenges: “Firstly, the money came too late. Secondly, it was only [raised] through budget reallocation which in the middle of the financial year is very difficult. We had to make cuts to health and education,” Mr Ba explained. ARC’s drought model in Africa RiskView converts rainfall data into drought information which is used to produce an estimated number of people affected by a drought and from that estimates the cost of responding to a drought based on the model. In light of climate change and competing demands on humanitarian aid, a growing number of governments are making financial resilience and ex-ante planning a priority. Governments are aiming to secure access to rapid financing to address emergency response which helps smooth the budget volatility associated with post-disaster expenditures. ARC was created with just such an aim and countries which have joined the risk pool are calling on others across Africa to participate. “There have really been a lot of benefits for us since Senegal signed up and we believe it is an opportunity for all African countries to sign up for an insurance policy,” says Mr Ba. The insurance provided by ARC is parametric which means it is based on a risk model’s estimate of losses rather than actual losses which allows the pay-out to be triggered rapidly after a disaster hits. The speed of the pay-out and the certainty of financial liquidity have efficiency benefits as vulnerable populations do not have to resort to negative coping skills. An independent study showed that one dollar spent on early intervention through ARC saves four and a half dollars spent after a crisis is allowed to evolve. 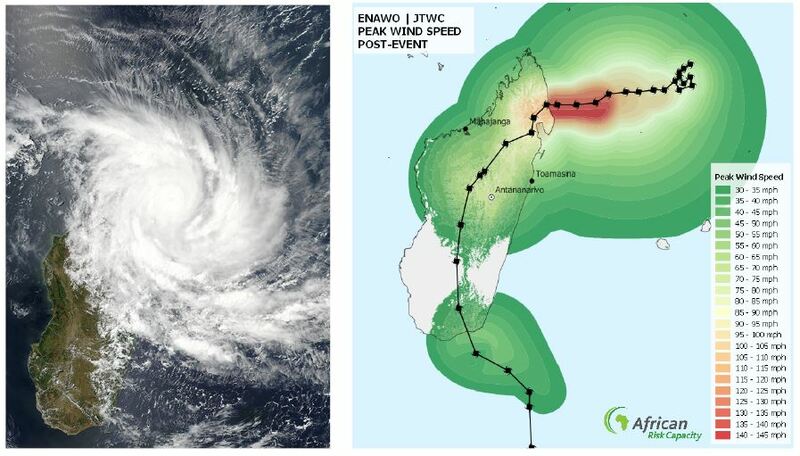 Tropical Cyclone Enawo hit Madagascar in March 2017. ARC’s cyclone model produced a wind speed footprint of the storm (right). ARC’s state-of-the-art modelling platform, Africa RiskView, uses satellite data to model a country’s drought and cyclone risk and will soon have a river flood risk component added. Governments work with ARC to customise the model to best represent their country’s unique risk profile. This customisation process allows a country to quantify its exposure to disaster risk – a critical first step in disaster management. Secondly, the model has an early warning system so governments can track a disaster in real-time as it occurs and start planning early. Countries joining ARC become effective owners of the company and drive high level strategic decisions. They also benefit from lower insurance prices as more countries with diverse risk profiles join the risk pool and can access private insurance and capital markets at competitive terms given that ARC transfers a portion of its risk to the reinsurance market. However, insurance is just one of the tools available for managing climate and weather risk and the concept still has a way to go. The so-called protection gap, the proportion of economic losses from natural disasters that is insured, was just 30% last year with insurance penetration at a much lower level in Africa.